Disclosure: I received a complimentary copy of this book from Tyndale House Publishers through Tyndale Blog Network in exchange for an honest review. 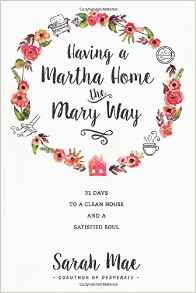 Having a Martha Home the Mary Way: 31 Days to a Clean House and Satisfied Soul is a brilliant book that combines having the Mary faith, along with the hard work effort of a Martha. Each chapter is broken down with a personal story from the author, along with a short scripture and faith related questions to fulfill the Mary aspect of your life, and also a challenge list for Martha duties. If you were to do a chapter a day, the Mary questions may take you 5-10 minutes, the reading the chapter about that long, and the Martha duties anywhere from 10-45 minutes depending on the duty at hand. This book came at such an amazing point in my life. I think I am a Martha, and I was thinking to myself I really need to have that Mary faith where I put my Bible time and quiet time with God first. I am always busy doing things such as cooking and cleaning first, and sometimes my Bible time gets put on the back burner. This book really helped me put things into perspective and allowed me to do both. The Martha duties to me were easy, and I enjoyed just being able to sit back and enjoy the Mary aspect of being in the Word. Even though the Martha activities were easy for me, this book also motivated me to do some heavy spring cleaning. I found 4 bags of trash in my house and we were able to donate 5 trash bags! I am a very clean person where I vacuum at least once a week and make the beds in the morning, and for the most part our house looks lived in but its clean. This book also helped to show me that my sons are old enough now to help in the house. This has been a blessing because it now gives me extra time with them so we can have more fun together! I would highly recommend this book, whether you are a Mary, Martha or somewhere in between. There is something in here for everyone. After reading this book, I now feel better about finding the balance between finding quiet time and Bible time with God, and also making sure I still keep my household clean and full of joy. This book sounds so great. I will have to check it out. Thanks for sharing with us on the #LMMLinkup and taking time out to comment today. Kelly, thanks for your insight on this book! Sounds really good! I'm heading to my Kindle right now to download this book! It sounds wonderful! Sounds like a lovely book! Thanks for sharing with #LMMLinkup! Interesting concept for a book. I'll add it to my Good Reads list. Thanks for sharing on #FridayFrivolity. We'd love to have you share with us again. Sounds like a great book. Before I was married with kids I was more of a Mary. Now it's easy for me to be like Martha and like Martha say, "But Lord look at all the work there is to do!" I am daily learning to put God and my quiet time first but also find grace when it doesn't happen as I would like. Like you I am also finding my boys can help out more around the house. Though they have chores they could easily be doing more. Thanks so much for sharing this great review. It sounds like a book I would definitely benefit from ! I have never heard of the concept of Mary and Martha before. I feel like I am always trying to find a balance in between, so I will definetly be looking in to this book! Great review and thanks for sharing at Family Joy Blog Link Up! This sounds like an inspiring read, I definitely need to channel my inner Mary and Martha to bring order to our chaotic home. It's one of my goals this year to make our home a "peaceful sanctuary" and I've got a lot of Martha-ing to do to get there. Thanks for sharing with Small Victories Sunday Linkup. Pinning to our linkup board and hope you found some great posts to visit this week! I loved reading your thoughts on this book! Thanks for sharing this post at Booknificent Thursday on Mommynificent.com this week! I need more of Mary's calmness today. I'm so Martha lately. This seems like a good help. Balance is key. we all have things we simply must do, but if we never spend time with the Lord...loving Him, worshiping Him etc then nothing else really matters. Thanks for sharing - looks like a good book. would be a great baby shower gift for the first time mom.